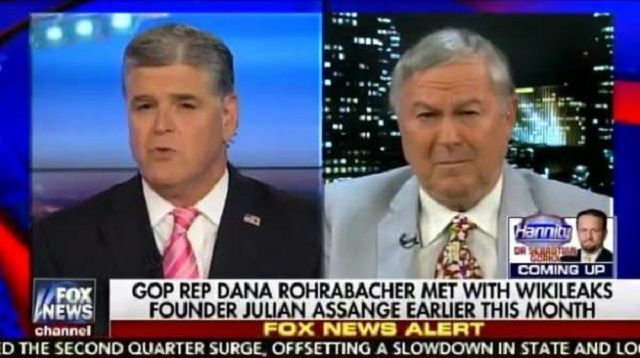 Rep. Rohrabacher met earlier this month with Julian Assange at the Ecuadorian embassy in London and is working to schedule a meeting with President Donald Trump to share his findings. Sean Hannity: Do you believe that this Trump-Russian collusion narrative will be proven false and do you believe [Assange] holds the key? Rep. Rohrabacher: The answer is absolutely ‘yes.’ And I think this Russian narrative that your talking about, this idea that is unrelenting, sinister story about how Trump colluded with the Russians in order to steal the elections is a total con-job. It’s a fraud. And it’s masking a power grab..
CNN reacted to this news with a story claiming the Senate Intelligence Committee now wants to investigate Rep. Rohrabacher. The Senate intelligence committee is considering calling on Rep. Dana Rohrabacher to talk about his meeting earlier in August with WikiLeaks founder Julian Assange, two congressional sources told CNN this week. Senate investigators are pondering how to proceed with Rohrabacher, in part because the California Republican is a member of Congress, the sources said. There is no indication that Rohrabacher is being investigated by Special Counsel Robert Mueller. But Rohrabacher does have connection to a person involved in something that has drawn the interest of investigators: the June 2016 meeting that Donald Trump Jr., Trump son-in-law Jared Kushner and then-Trump campaign chair Paul Manafort had with a group of Russians, including lawyer Natalia Veselnitskaya. Rohrabacher was not at that Trump Tower meeting, but he was working closely with Veselnitskaya and others to try and repeal the Magnitsky Act, which targets Russians whom the US considers human rights abusers. “He hasn’t been contacted by the committee, but is happy to talk with them after he talks with President Trump,” Ken Grubbs, a Rohrabacher aide, said Wednesday, of the Senate intelligence committee’s possible interest in speaking with him. Could this con-job get any more obvious?